A floppy disk can be selected together with other partitions and placed inside the same ADI file as hard disk partitions. 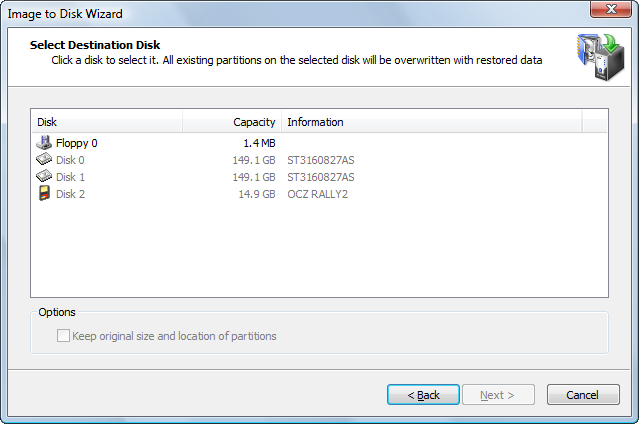 However, due to the uniqueness of a floppy partition, it can be restored only to a floppy disk. Again, since there is no MBR structure on a floppy disk and a single partition occupies the whole disk starting from sector 0, Floppy device cannot be selected. As a result, when a floppy image is selected in a backup, only a floppy device can be a target.